Modified properties are indicated with bold labels. Inserting Objects into a Layout Objects can be inserted into an existing layout by dragging them from their current positions and dropping them at the required location. These features can be useful if you have many overlapping objects. This ensures that the objects will be displayed properly when the form is previewed or used in an application. Widgets can be dragged from the widget box and dropped onto the form. Horizontal and Vertical Layouts The simplest way to arrange objects on a form is to place them in a horizontal or vertical layout. The Object Inspector The Object Inspector The Object Inspector displays a hierarchical list of all the objects on the form that is currently being edited. Placing objects in a layout also ensures that they will be resized correctly when the form is resized. To quickly duplicate a widget, you can clone it by holding down the Ctrl key and dragging it. This allows widgets to be copied and placed on the form more quickly than with clipboard operations. All of the above actions apart from cloning can be accessed via both the Edit menu and the form's context menu. The Grid Layout Complex form layouts can be created by placing objects in a grid layout. Editing Properties The property editor uses standard Qt input widgets to manage the properties of objects on the form. Holding down Ctrl and dragging the widget creates a copy of the widget that can be dragged to a new position. Dynamic Properties The property editor can also be used to add new dynamic properties to both standard Qt widgets and to forms themselves. All other trademarks are property of their respective owners. To add a dynamic property, clcik on the Add button. Documentation contributions included herein are the copyrights of their respective owners. 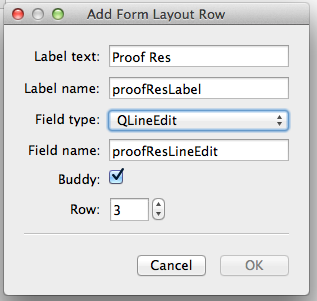 You can use this feature to create more than one copy of the same form, and experiment with different layouts in each of them. Applying and Breaking Layouts The simplest way to manage objects is to apply a layout to a group of existing objects. Splitter Layouts Another common way to manage the layout of objects on a form is to place them in a splitter. To check if you have set a top level layout, preview your widget and attempt to resize the window by dragging the size grip. Horizontal and vertical layouts can be combined and nested to any depth. These splitters arrange the objects horizontally or vertically in the same way as normal layouts, but also allow the user to adjust the amount of space allocated to each object. It is also possible to drop Widgets onto the Object Inspector to handle nested layouts easily. The broken layout icon is displayed if there is something wrong e. Instead, you must either break the layout and adjust each object's geometry manually, reporting internet dating scams or you can influence the widget's geometry by resizing the layout.